Are you interested in involving community in your research process but uncertain where to start? Do you already involve members of the public in your research process and would you like to connect with like-minded people around your experience? 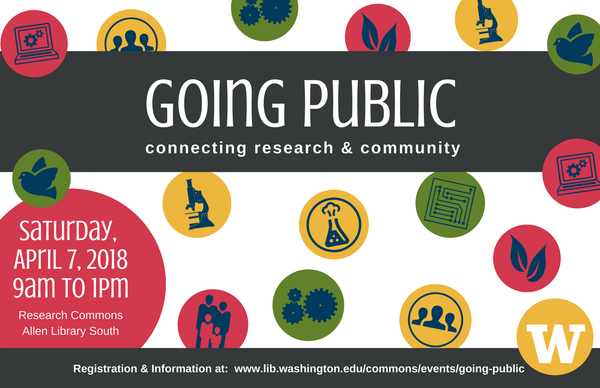 Join us for “Going Public: Connecting Research & Community” where we’ll explore engaging community in the research process through public scholarship, citizen science, community-engaged research, and participatory research. This interdisciplinary event offers an opportunity to expand your skills through several workshop offerings, to hear from researchers and community participants on their experiences through our “Research & Community Connections” panel presentation, and to see the different shapes this research can take through our graduate student poster display. This event is free and open to all: faculty, staff, graduate and undergraduate students, and community members from outside the university. Registration is now closed. Join us online with the hashtag #GoPublicUW!